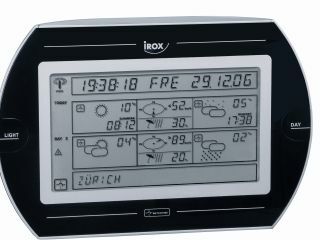 Weather Front Ltd has launched the Irox Mete-On 1, a new portable weather prediction device for the home. Mete-On 1 displays a weather forecast for four days and nights in 60 regions around Western Europe . It also provides two-day forecasts for many other regions outside this area. The forecast is produced daily by professional meteorologists working on the Campus of Bern University in the capital of Switzerland . It is broadcast alongside the Swiss (HGB) and German (DCF) time signals, giving it a range in excess of 1,500 km from the transmitters. "Mete-On auto detects and selects the strongest signal and has a test mode to help the user to find the best location for their display," says a statement released by the company. Mete-On 1 enables the user to set their home location as well as the ability to view the forecast for any other of its regions, five of which can be added as quick access favourites. The forecaster will be available shortly, although no pricing information is available at present.